Seriously, I do not have a shoe problem. But I do have a color fetish, and the need to be surrounded by it. 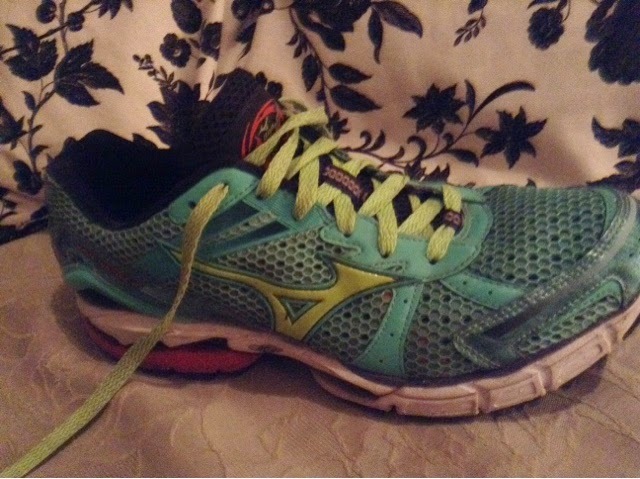 I recently acquired a new pair of running shoes, Mizuno Wave Inspire 11's. Yes, they were already very stylish and pretty. But, Hello! They came with boring laces that kind of just blended in. And, although I like the silver Mizuno logo, it really didn't stand out much against the light teal green background. What's a color-obsessed gal to do? I snagged some fun orange laces in a store, and grabbed a matching Sharpie marker and colored in some of the sole (and added some shimmer to the silver trim). Problem solved. Rest assured, this was not the first time I have taken it upon myself to fix a similar problem. 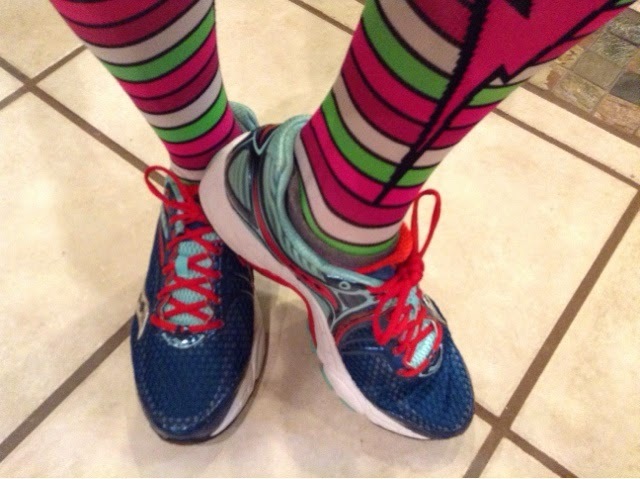 I envy fellow runners who seem to have an endless selection of festive shoes in a (bright) rainbow of color options. It seems like the shoes that fit me best just do not have the color options I desire. And actually OK with that. I kind of like the challenge of making each pair of shoes MINE and mine alone. Nike Moto 7's.....this is where it all started. These came with (boring) white laces. Seriously, what is UP with that? 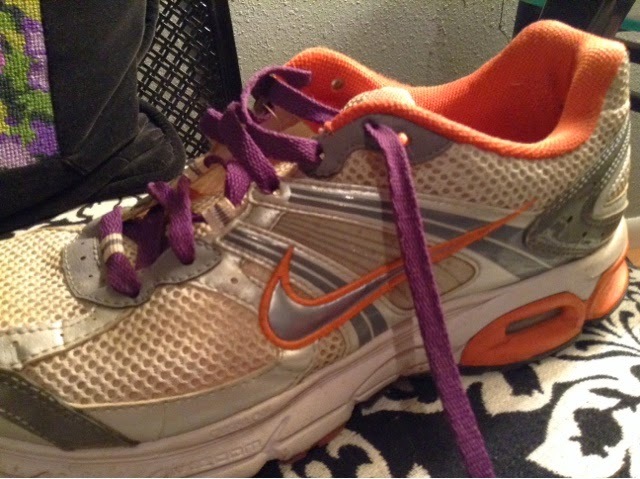 I swapped out the white laces for purple, and instantly my spirits were lifted (as was my stride). Transformation #2 happened with the Nike Structure 14's. 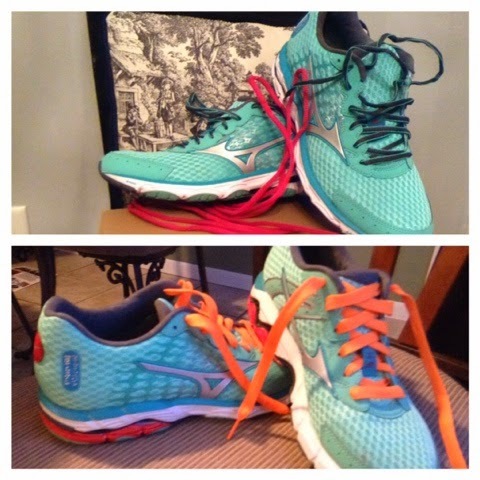 I can't remember now, but these either came with white or grey laces ((yawn)), so a color overhaul was in order. I used a turquoise Sharpie to snazz up the soles (which have faded considerably from numerous miles trodden) and switched out the laces. Onward to the Nike Structure 15's. I really loved the magenta accents on these.....but that's where the color stopped. I Sharpied up the soles with lime green (which has also dramatically faded), colored in the swoosh and did my patented "lace swap" on these as well. 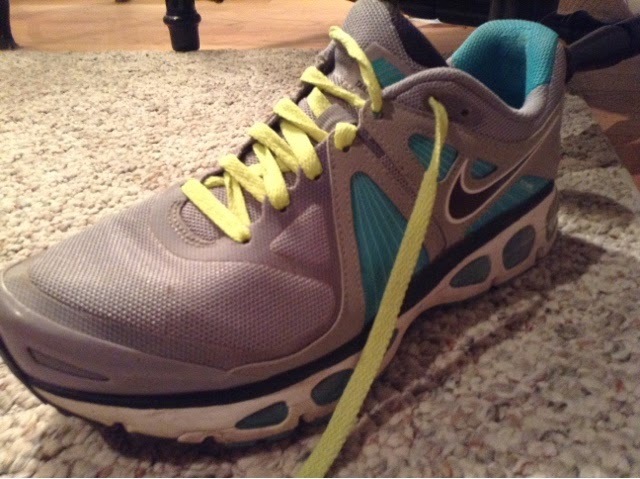 These are Nike Tailwind 4's...and they also came with grey laces...can you see a pattern here? 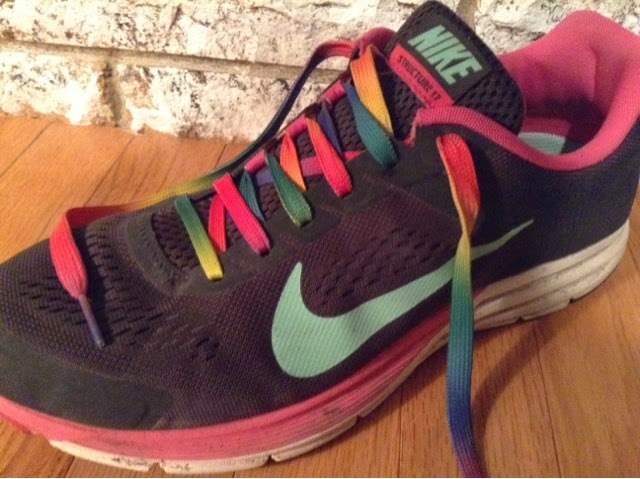 These shoes have had lime green laces and pink laces, and are currently sporting yellow laces. 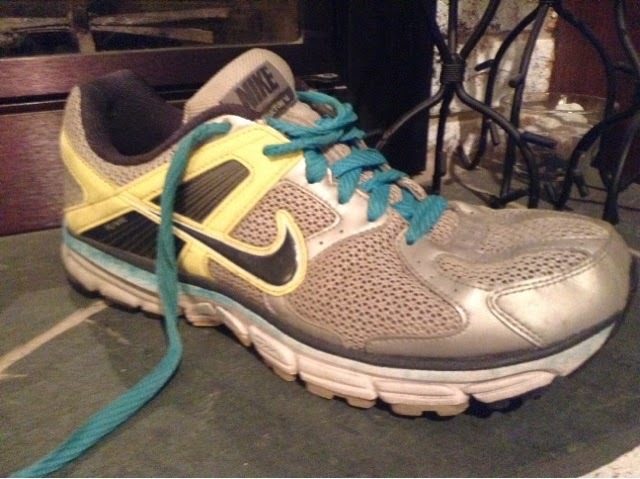 I got these for a steal-of-a-price at an outlet store, and use them only for short runs (nothing further than 3 miles). They did land me a PR last summer, though, on the 4th of July, and we brought home the 2nd place AG medal. 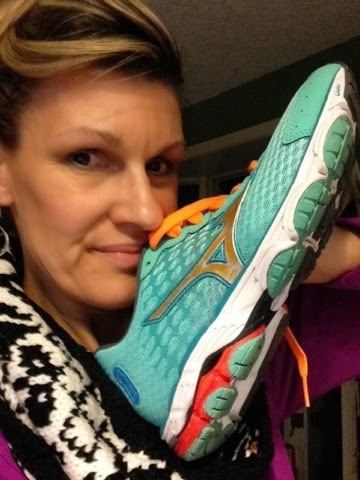 Ah, my first pair of Mizunos, the Wave Inspire 8's. The black laces just weren't doing it for me, so I found some lime green ones (that matched the logo). Much better. 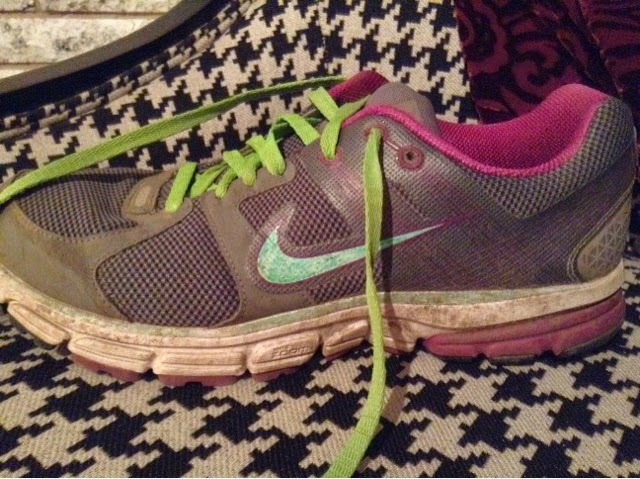 These babies have some serious (and some fun) miles on them....we're talking numerous half marathons (not sure exactly how many...10? 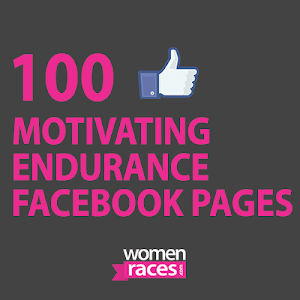 ), two full marathons, and thousands of training miles in the mix. Nikeys will always hold a special place in my heart. These Structure 17's came with black laces, though. Ugh. I swapped them out for hot pink, but eventually settled on these rainbow delights. What do you think? Am I crazy? or just CrEaTiVe? Have you ever "enhanced" a pair of shoes? 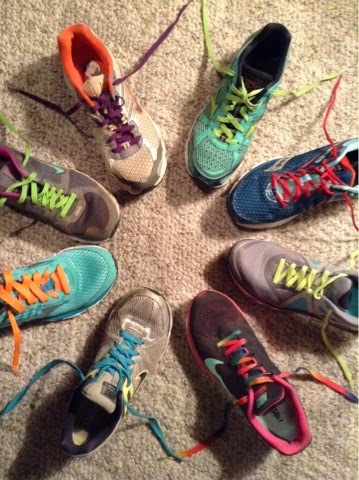 Do bright shoes make you happy? Or are you a "neutral" color person? Some events are better than others, but some just stand out as the Most Favorite. I've been running for almost 10 years. In that time, I have done a pretty colorful mix of race distances, locations, and variety of events. 1. Dam to Dam-May 2008 (20K). This was my first-ever "big race." I had never run farther than a 5K, and it took me several months to get up the courage to register for this one. I had to walk a few times, but finished in 2:07....and felt like such a champion. I've gone back and done this race every year since. In 2014, it changed to a 13.1 and probably will always be my favorite event. Forever. 2. IMT Des Moines Half Marathon-October 2008. This race is also pretty high on my list of favorites. Other than a few quick steps through the water stations, I was able to run the entire race without needing any walk breaks. My husband was there at the finish line, and somehow he coerced the three kids to join him (they would have much preferred to stay in their warm beds at the hotel). I finished in 2:05, and was very pleased to have been bitten by the "distance race" bug. 3. 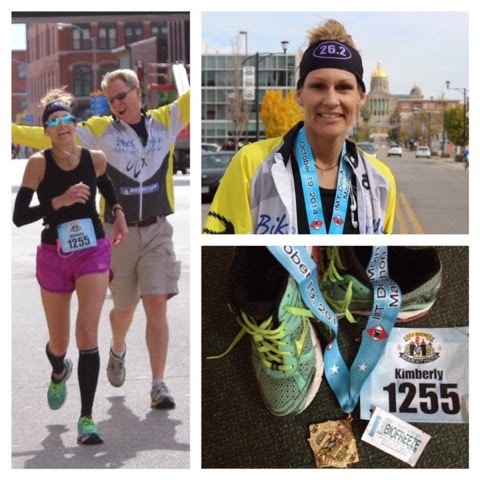 Quad Cities Marathon-September 2013. This was my first-ever 26.2, and I was blessed with a perfect experience. Awesome weather. Fabulous crowd support. The husband (and other family members) along the course and at the finish line. I also met a gentleman at mile 25, who caught me walking and offered to "run me in." Upon chatting with him, I learned he had run every Quad Cities Marathon prior (this was his 16th), and he kept telling the crowd ,"This is KIM! 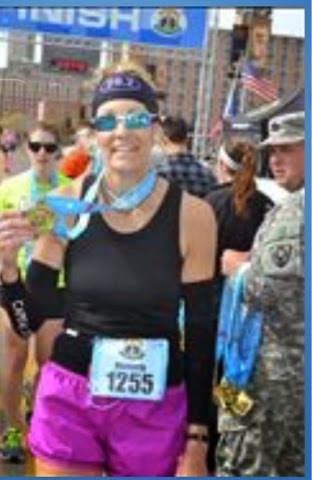 And this is her first marathon!" Seriously, how many first-time marathoners get that kind of an experience on their way to the finish line? 4. 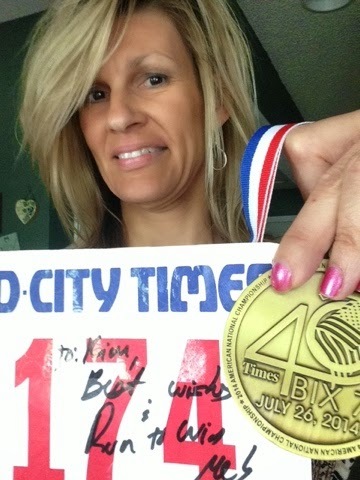 The Quad Cities Times Bix-7-July 2014. This was my third time running the seven miles of hills (in the July heat) that make this race so famous. I had the privilege of meeting Meb Keflezighi at the expo (and had his autograph on my bib for mojo). I didn't PR, but I came within a few seconds...a major feat for someone who has battled piriformis issues in recent years (and didn't have these aches & pains when I ran the race in previous years). 5. 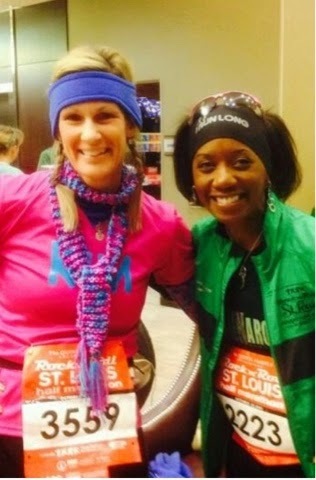 Rock'N Roll Half Marathon-St. Louis-October 2013. This race was a first for several things. It was my first Rock'N Roll event. 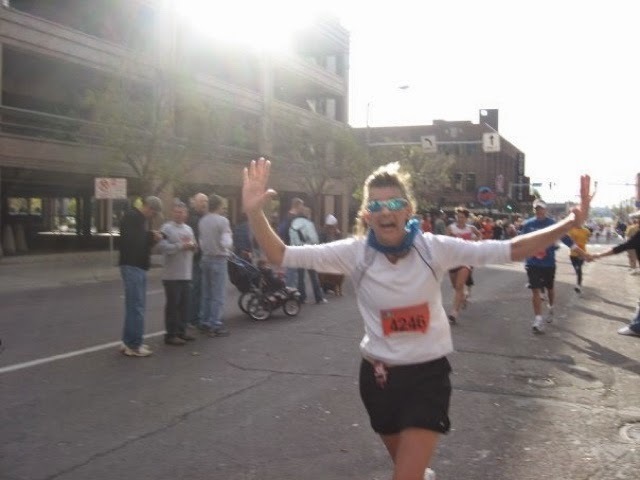 My first race in St. Louis (subsequently during the World Series). 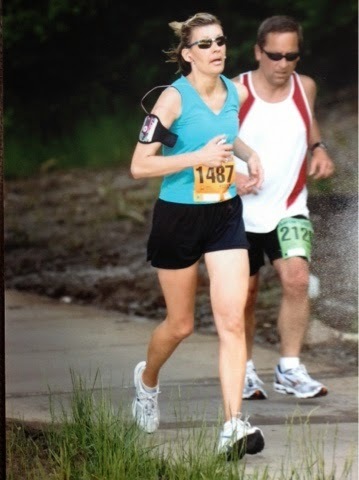 My first-ever race run while chatting non-stop with a friend (Fran, a gal I had met through my Facebook page). It was a challenging race in that there were constant rolling hills, but Fran and I managed a 2:07 finish time...even with our non-stop talking and laughing (and a few pit stops along the route). 6. Rock'N Roll ReMix Festival-Chicago-July 2014. This was not just one race, but two. I met up with another wonderful friend, Penny, and we ran the 5K on Saturday and the 13.1 on Sunday. We also got to meet Shalane Flanagan (but we weren't able to keep up with her pace). 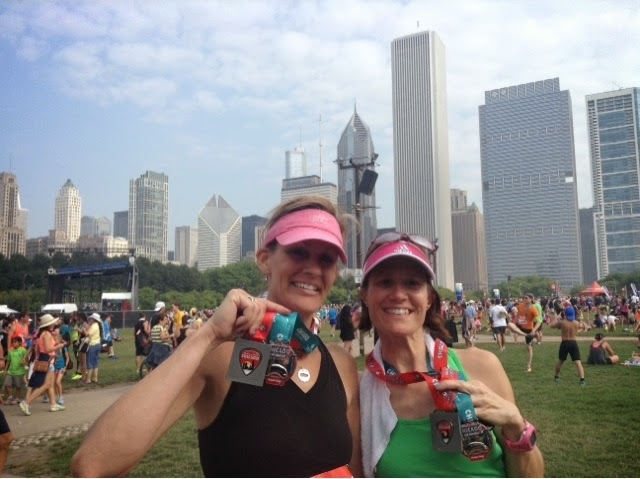 Although the weather was very hot and humid, and there was some discrepancy on the course distance, it was a scenic tour through the beautiful downtown streets of Chicago....what runner wouldn't love that kind of scenic tour with a favorite friend? 7. Fight for Air Climb-Chicago-March 2014. I am a huge advocate for fresh air and healthy lungs. I'm also a huge advocate for all things fitness (not just running), so this event is very dear to me. I have done the Des Moines event twice (and am registered for my third DSM Climb on March 22nd), but the Chicago Climb was a beast! We climbed the four Presidential Towers, for a total of 180 flights of stairs. It was oh-so-tough, but oh-so-fulfilling to reach the top of the final tower. This event is a national event in various cities, with all proceeds benefiting the American Lung Association. 8. 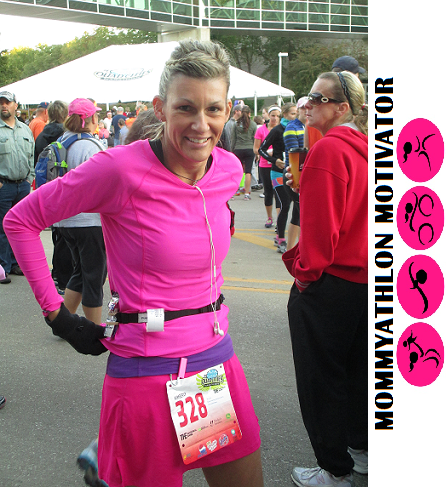 IMT Des Moines Marathon-October 2014. I have run the half marathon four times, but in 2014 I took on the challenge of doing the full marathon. What an amazing event! 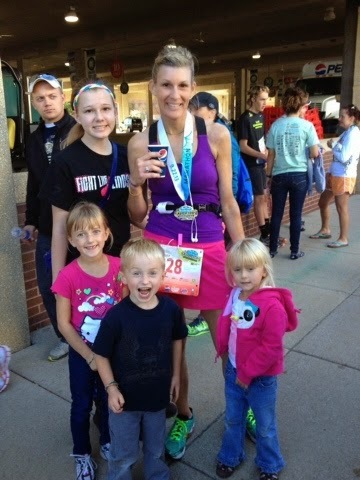 Again, I was blessed with fabulous weather, amazing crowd support and the husband and family at the finish line (and also a few friends along the route). This course was tougher than the Quad Cities Marathon with several hills along the route, and although there was ample sunshine and warm temps, there was substantial wind in the final 5-6 miles. But, I managed a slight PR (can you say, "7 seconds?") despite the extra work it took to get to the finish line. Finishing this race made me feel like a legit marathoner. 9. 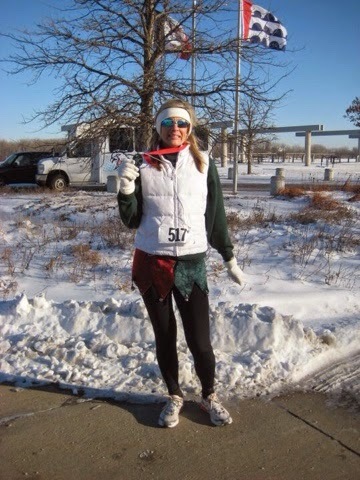 AIB Jingle Jog-December 2010 (4 Miles). This involved a couple loops around a lake in the cold of winter, in the beautiful sun with a dusting of snow. 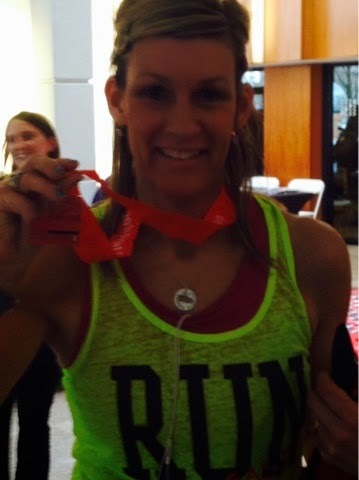 And I placed first in my age group! I had never placed in the top three in any race, so getting the first place medal was especially sweet. I have run this race every year since, and placed in the top three (the race was cancelled in 2014). 10. Hy-Vee Triathlon-September 2012. I participated on a relay team (as the runner, go figure). Our team finished in the top 30 out of 130 (or so) teams. Being the runner, I had plenty of time before it was my turn to get passed the baton (so to speak), so I got to watch lots of other triathletes while I waited. Wow. I saw athletes of every size, shape, and speed go whizzing by the stands on their bikes. It really hit home the value in accomplishing a goal. Most of these people were not competing in hopes of winning, but they had the same finish line to cross. How Do Ya Like These Lemons? There's a big difference between running-related injuries and injuries that happen while running. Case in point, let me tell you about the latest "injury" to find its way to me. Doesn't the snow look pretty? 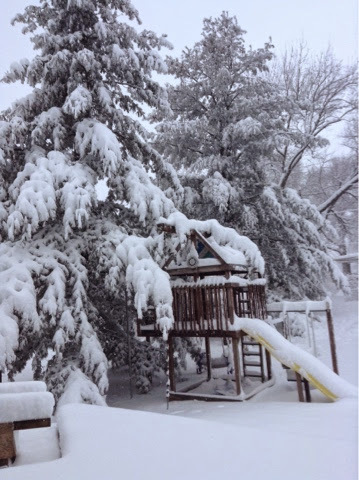 We had (almost) a record-breaking snowfall this past weekend, to the tune of over 14 inches of the white stuff. 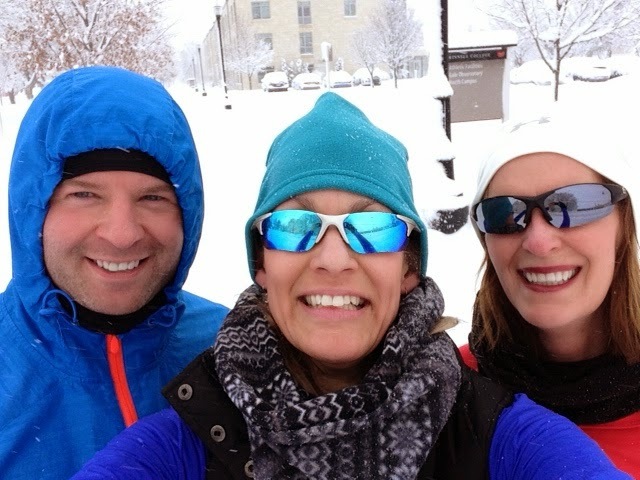 I have not had much for snow running this winter. There has been snow, but not like usual. We have had plenty of artic-like temps and wind, though. A couple of friends and I decided to get outside and have some fun. Even with the wind, it didn't feel that bad out on the streets. We knew to be careful because we'd gotten some rain the day prior, and a lot of the rain had frozen under the thick snow. The thing is, because the ice is hidden, you don't really know where it is...until you slip on it. I went down a couple times during those five miles in the snow, but it wasn't until I was two blocks from home that I went down hard. The kind of solid landing that (literally) took my breath away and knocked my sunglasses sideways. As I was pulling myself back up, I decided to just walk the rest of the way home. A couple steps later, I went down again, this time landing on the other side (and on my left elbow). Nothing really seemed to hurt (much), and I was laughing at my own klutziness as I hobbled back to my house.That was late Sunday morning. Fast-forward to Monday morning, I could hardly crawl out of bed without wanting to scream. 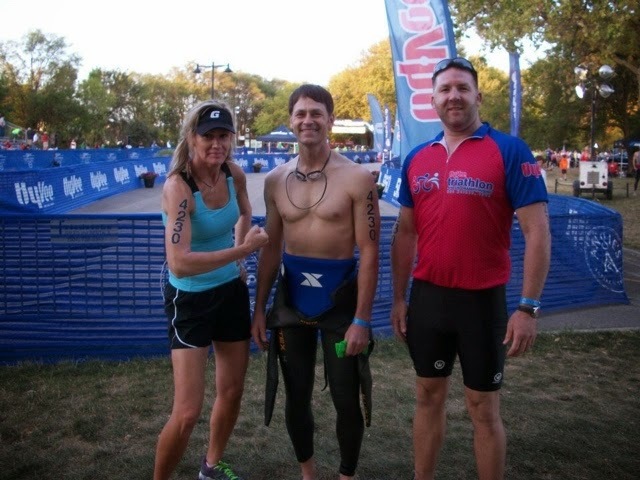 The pain on my right side (in the rib cage area) felt like it did 18 months prior when I took a fall on a trail run. I was rewarded with a few bruised ribs from that trail fall. Although I was able to continue running through the healing process, it took several weeks before I felt completely healed. I tried running some stair intervals Monday evening, and it was difficult. 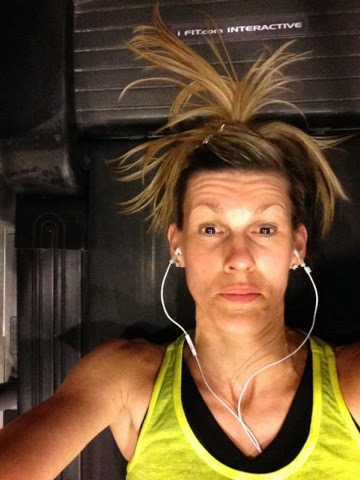 I then tried to run on the treadmill and it was even worse. The sore and swollen tissue surrounding the ribs makes it difficult to get a deep breath, so any heavy-duty-breathing is not pleasant (nor advisable). So, what's a girl to do? Fortunately, I'm not just a runner, and I have lots of good 'ole cross-training options to turn to. Other than doing a few series of squats and a couple of easy yoga poses, I gave myself (almost) a complete rest day on Tuesday. 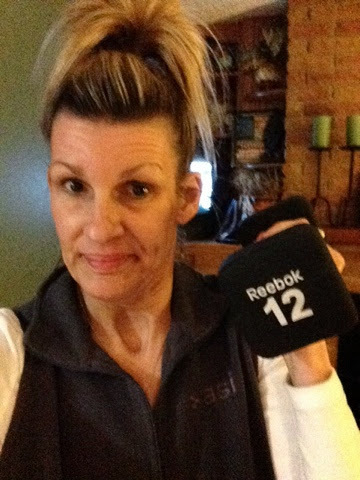 On Wednesday, I did some arm work (being careful to not do anything that would put strain on my mid-section), and several sets of squats (some with weights, some without). I usually do a daily 2:30 plank every morning while my chai latte' is 'brewing," but that hasn't happened since before my fall(s). I was able to do several shorter planks (1:00-1:30) during the Super Bowl (as part of a workout), and some knee-push-ups...but anything else that involves my core is too painful. Ugh. What does a bruised rib (or several) feel like? It's kind of a tightness in the rib-cage area., it hurts (almost) every time I sneeze, cough or laugh. It can be difficult taking a deep breath. Rolling over in bed is pure torture, as is trying to get out of bed. I know this is only a short-term situation, though, so I'm making the best of it. I have a 5-mile race coming up on Valentine's Day, so I need to stay on the down-low and allow my body some R&R. All is good, and I will be just fine. 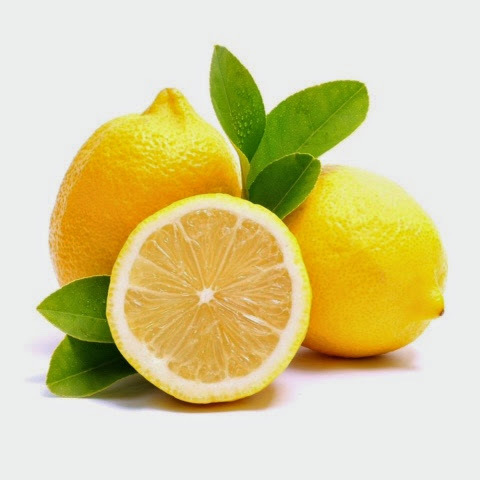 How do you like these lemons? They say, "When life gives you lemons, make lemonade." 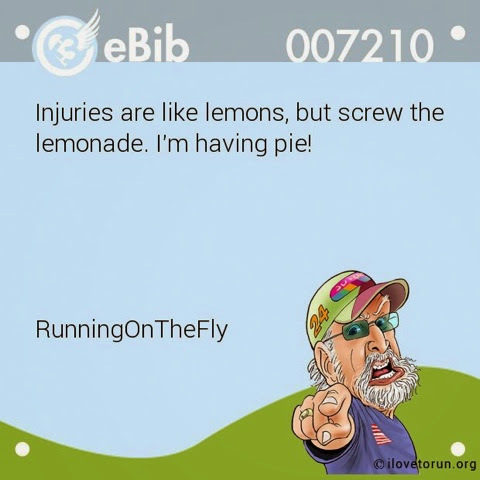 Well, forget the lemonade, I'm going for pie! Have you ever taken a big fall during a run? Ever bruised or broken a rib (or several)? When I think about yoga, the first thought that comes to mind is TRANQUILITY! Yoga centers me and makes me feel strong. That’s why I am SO thrilled to participate in prAna’s Take The Leap 30 days of Yoga Challenge with Sweat Pink. I plan to TRIANGLE my way to a more balanced and grounded 2015! For me, the biggest challenge when it comes to yoga is FOCUSING on the present moment. 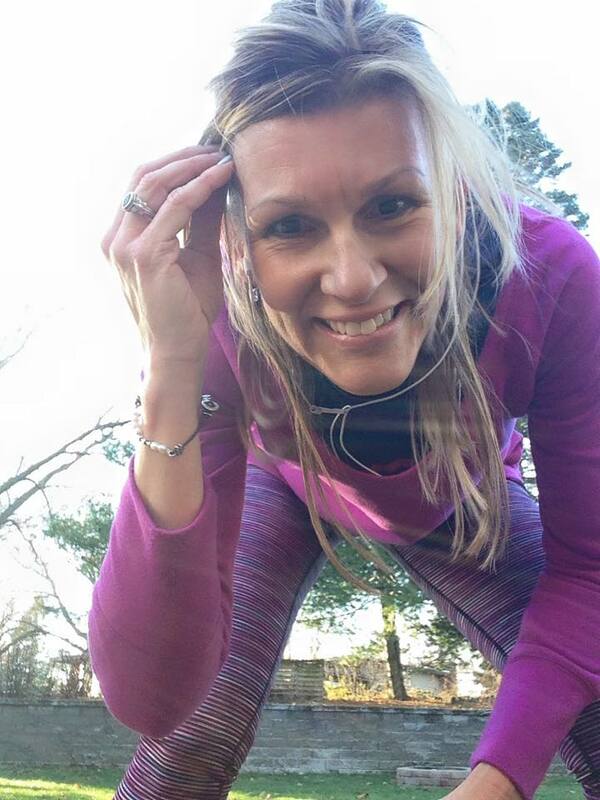 Taking the Leap with prAna and Sweat Pink is a great way for me to UNWIND at the end of each day as well as increase my flexibility and strength. My favorite place to yoga is actually in a class because I don't have the distractions of my home or countless "to-do" lists invading my mind! Here’s a photo of me in my very best meditative yoga pose. 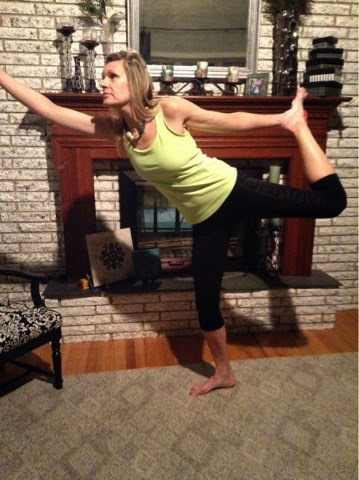 It requires complete concentration to maintain this balance pose (I jokingly say the my balance is my downfall #truth). I tag Fran @I Run Long_ and Tracy @RUN? Are you in? 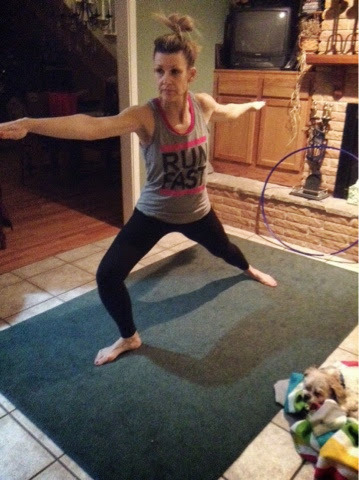 !I would love for these fabulous ladies to share their very best yoga pose photos, this fun madlib and of course, I challenge them to join me on this fun 30 day yoga journey. 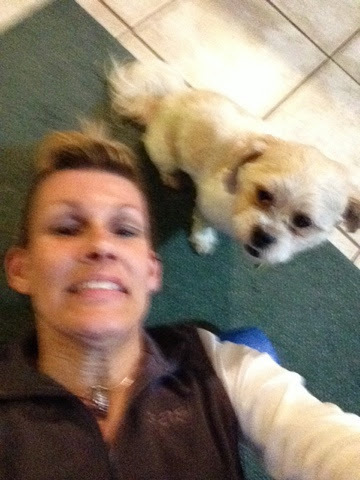 If I win I would gift the $500 to my best running buddy, Barb, because she is always willing to lace up and hit the road with me.